News Flash: Winner Irish Setter Club of America Most AKC Titles won by an Owner 2015 13 AKC Titles. Amazing Job by my dogs, Jada, Princess Stripey, Chaos and Nola. So proud of them. Chaos Wins Runner up for Novice Agility Standard. Jada Runner UP, Best Matron, Versatile Companion Events Award. 5 Titles on 2 Get. 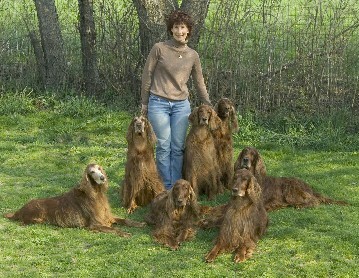 My Irish Setters can do it all! They excel in the Conformation Ring, Agility, Obedience, Rally, and in the Fields. Goldie, Linda, Buttercup, Glitter, Angel, Kaylee, Megel, Jake, Spring 2005. My name is Linda Scopa, and I have been a professional dog trainer since 1998. Ohkom (pronounced OAK-um) Farms, a dog training and obedience center in Greensburg, PA, was started because I have had a personal mission, from day one, to train dogs and their owners. During my years working in a Veterinarian’s Office and volunteering at numerous animal shelters in the 80’s, people would actually want to put their animals to sleep due to behavioral problems. Due to the rabies law and the inability to vaccinate for rabies until your puppy was six months old, there was no training available until your dog was six months old. My initial idea was to train as early as possible. To get owners educated before the bad behavior started. I began helping people in their homes to train early, and even brought the puppy home with me, if necessary. Hence, less dogs in the shelters and more happy owners. With today’s early rabies vaccinations, we are now able to start puppy classes as early as 12 weeks of age so owners can educate themselves and be better prepared to work through those tough puppy stages. I will always put the health and the welfare of your puppy first. My Training is always positive reinforcement. My mission is to help you through important training stages being Fun, Firm and Consistent. And remember, no question is stupid, just ask! Our most important message? Train, Don’t Complain! Ohkom Farms Training Center is centrally located between Greensburg, Latrobe, Delmont, and Murrysville, PA. We’ve designed a training center for all types of training that you’re looking for you and your dog. We have Day and Night Classes, Private Lessons, Canine Good Citizen, Therapy Dog, Day Camps, Day Training Camps, and Boot Camps (2 week live in Camp). Come train your dog with us and have fun doing it! New in 2016 we have added our On Line Training http://ohkomfarms.com/me-and-my-dog-program/ There’s something for everyone. Had to share this beautiful photo of my Buttercup and Megel from July 2003. They were 3 years old. That was their spot in the yard, under the tree. I lost Buttercup and Megel, both at 13 years old. May 2012 and June 2012. Hug your Fur Kids EVERY DAY In Memory of Jake 1-15-1997 to 11-22-2011 Ch. Ohkom Windberry CGC To the Wind, my Friend, to the Wind. THE Ohkom Kids enjoying a beautiful fall sunny day. October 2010 L-R Chaos, Princess Stripey, Jada, Buttercup, Jake, Megel, Kaylee. In Memory of my beautiful Goldie she loved the snow. Ch. Ohkom Goldenberry 1-15-1997 - 12-17-2009 a Favorite photo from 2003 "Peaceful Snowflakes of Ohkom" f-b Kaylee, Angel in Spirit, Goldie in Spirit, Jake, Buttercup and Megel. Spring 2004 Sitting left Kaylee, Jake. Middle, laying front Angel, Goldie. Right, sitting, Buttercup, Megel.